PTCL announced the availability of its Video phone services nationwide. PTCL's video phone service is named as “VideoCon”. This service is beneficial for both corporate and residential customers, PTCL VideoCon is the country’s first and only video phone service which allows real-time video conversations with friends, family or business associates. Through the videophone PTCL customers can make or receive video calls from other customers who have video phones and make voice calls to regular customers. The video call made through this service will have better quality video which streams in real-time as compared to other alternatives like internet based video conferencing services. 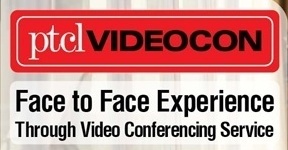 Videophone was launched in June 2011 in Lahore, Karachi and Islamabad. Now this product is ready for country wide launch. Customer should have a PTCL PSTN and Broadband Connection (1 Mbps or higher) and separate Video Phone through Soft Switch will be provided to the customer by PTCL. Both the caller and the receiver have to have a video phone to make a video call. For availing IPVP & DSL Bundle packages altogether, Standard tariff will apply for the bundle package. In this scenario, only discount will be Rs. 500 per month for the first six months on IPVP.